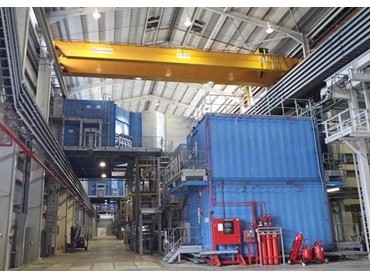 Northern Utility Resources Generation (NUR) has chosen Konecranes ’ crane services to be part of their Kulim Hi Tech Park project. Konescranes will be using their services to help NUR’s Kedah plant provide 220 Mw of electricity to the Kulim Hi Tech Park, which homes more than 50 company headquarters for Malaysia and the broader Asian market. Konescrane has expanded their range of crane services to providing electrical generation and distribution industries with heavy lifting equipment that helps maintain their maximum uptime and 24/7 operations. NUR’s Kulim co-generation plant involves four gas generators and two steam generators driven by heat from the gas generator processes. These high technology facilities are serviced and maintained by Konecranes’ team of seven production and service cranes. Konecranes cranes are used for a wide range of applications, in the generation plant, from lifting turbines and rotors to periodic maintenance on day-to-day services of diverse, heavy and expensive workpieces. “This is a very versatile site, set up to ensure security of electricity supply to customers who require world’s best standards of reliability,” says Energy Management Services Mechanical Supervisor Mr Johnny Lillis. Konecranes are dedicated in providing crane services that meet world standards of safety, reliability and efficiency across Australia and the Asia-Pacific.